15930 4.8 years ago Steven Hohensee Easton, KS , US Human Rights Watch is a complete disgrace to the cause of human rights. Always behind the pack when criticizing US crimes, but leading the pack when it comes to Venezuela or Cuba. 15927 4.8 years ago William Rico Needham, MA , US If HRW were to focus on the puppet masters in the US government as much as it does on their puppets in developing countries, the cause of human rights would be furthered greatly. 15926 4.8 years ago Lucinda Cross Cape Town, ZA It's unclear why HRW has become defensive about these proposals. they're uncontroversial and apply equally to all governments and political agendas. 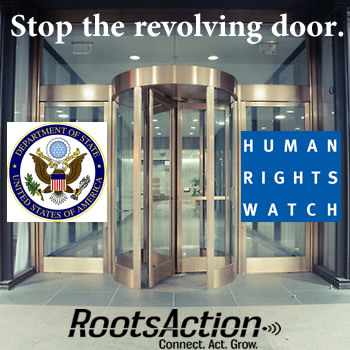 15924 4.8 years ago Miriam ADAMS Albuquerque, NM , US No more revolving doors...Human Rights are too important to contaminate with political agenda. 15923 4.8 years ago Mary Saunders Portland, OR , US Re-building credibility may be possible, but present conflicts make that a big challenge. 15921 4.8 years ago Don Nash Globe, AZ , US Human Rights Watch really needs to stop being so feckless and distance itself from all things U.S..